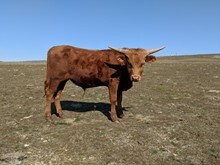 We believe he is truly "HOT": Still Growing Horn Like Crazy after breaking off at least 8" as a long yearling! Bronze winner for Composite in the 2017 Horn Showcase. His (actual NOT reconstructed) Total Horn was just shy of 100" as a 3 year old! His first calves are VERY calm & big bodied; more coming soon! Tip to Tip 79.5000 07/29/2017 Reconstructed from good side: 39.75"
Total Horn 97.0000 07/29/2017 Reconstructed from good side: 48.5"
Tip to Tip 65.0000 12/03/2016 Reconstructs to 73"
Tip to Tip 61.0000 09/06/2016 Modest Reconstruction: 69"!